The term, ronin, simply translates to a ‘wandering man’ in Japanese, and it was used to describe a masterless samurai warrior in feudal Japan – equivalent of unemployed men in today’s society. This meant they would be happy to serve any daimyo lord who paid. There were a number of different potential reasons for a samurai to become a ronin, detailed in this page. It was also common for ronin to hire themselves as less established and desirable positions, such as bodyguards mercenaries. What’s more, many of them turned to become criminals. a ronin reloading their weapon. The most common reason for a samurai to become a ronin was due to the death of his master. The daimyo master could have been killed by the enemies in a civil war, or losing battle and was forced to kill himself. It was also possible for a samurai to become a ronin when their masters lost their power and privileges. Ronin had a low social status and a very negative public image. One of the reasons why ronin were not highly regarded by, the whole of the Japanese society was because they were seen as ‘failed men without honour’. During the feudal period of Japan, samurais who lost their masters were expected show respect by committing suicide, typically with the harakiri method, also known as seppuku, according to bushido, the Code of the Samurai. Harikiri (Seppuku) is a type of ritual suicide used by the most samurais. It was meant to show honour and respect to their ceased masters. As ronin failed to do this, they were considered as cowardly and shameful. During the early feudal periods including the Kamakura, Muromachi and Azumi-Momoyama periods, the government allowed samurais including ronin to change their occupation. This meant ronin could choose to take occupation in a lower class including merchants, farmers, fishermen and peasants. An example of this was following the Battle of Sekigahara in 1600 when the number of ronin significantly increased, and many of the samurais of the defeated daimyo became farmers and fishermen to seek a better life. 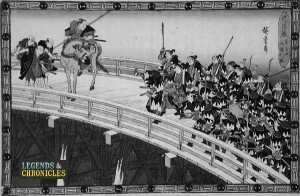 A group of ronin being halted by a representative of the shogun. Furthermore, it was possible for those in lower social classes to become samurais. However, the Tokugawa bakufu made it illegal for them to change their professions in the Edo period. Therefore, many of the ronin who could not get employed ended up taking up jobs like bodyguards and mercenaries, also known as yojinbo. 47 Ronin, also known as ‘shiju shichi shi’ and ‘Genroku Ako Jiken’, which took place on Devember 14th 1703, was the most notable and celebrated event of ronin and samurais. 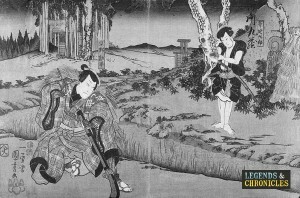 A group of ronin attacked and killed Daimyo Kira Yoshinaka by cutting off his head in revenge of their daimyo master, Asano Naganori who was forced to commit suicide. The event took place 14 months after the death of Daimyo Asano. During the 14 month period, the ronin planned and waited for the right time. Following Genroku Ako Jiken, all of the 47 ronin involved committed harakiri. On the positive side, 47 Ronin enabled the Asanao clan’s lordship to re-establish in Japan. Sakamoto Ryoma was an anti-Tokugawa bakufu ronin. Sakamoto Ryoma is best known for setting the Satsuma Choshu Alliance in 1866 during the bakumatsu period – the final years of the Edo period before the Meiji Restoration. Miyamoto Musashi was a great swordman and ronin who was never defeated in his 60 sword fights. Miyamoto was also the author of ‘Gorin no Sho’, which details the original pholosophy and technique of kenjutsu. Yamada Nagamasa was a former samurai and became a ronin following the Battle of Sekigahara. He became an adventurer who traveled between Japan and the Ayutthaya Kingdom, and eventually became a advisor to the King of Siam.